I decided I needed to finish this quilt top before going to pick up the kids from school. It has lots of mistakes and problem areas and I learned a lot making it. Mostly I learned that I won't do it that way again! I'm going to get batting this weekend and will finish this up soon. I think I made this in 2001 or 2002. It has fluffy poly batting and minimal quilting. The batting beards somewhat and the binding is undone in a few places. 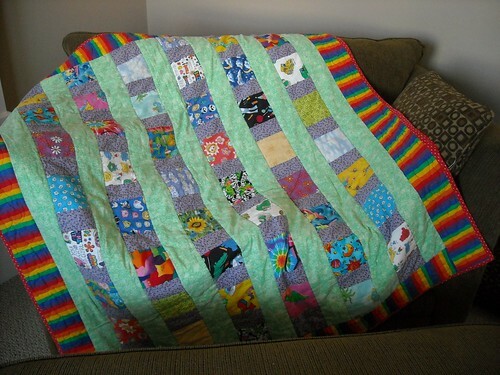 But we all love that quilt for snuggling. Vicki, Thanks for the picture. I also used poly batting and tied my quilt and of course all the ties came out the first time I washed it. I thought I made mine in 2000 but maybe it was 2001. Happy quilting. Love the scrappy to top! 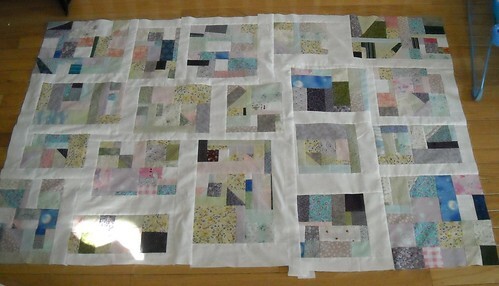 I'm trying to make a string quilt which is sort of a scrappy quilt too but it seems less scary to me somehow.